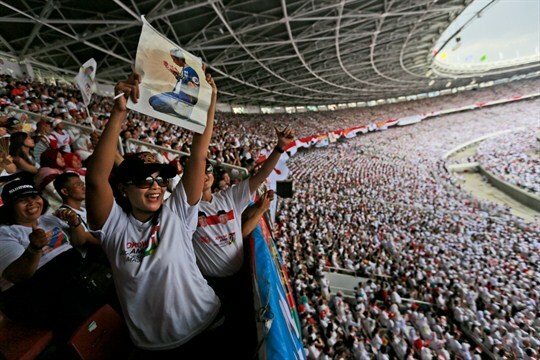 Indonesian women cheer during a campaign rally for Indonesian President Joko Widodo at a stadium in Jakarta, April 13, 2019 (AP photo by Dita Alangkara). Indonesians go to the polls this week to elect their president and a new parliament. It is the first time in Indonesia’s modern history that both elections will be held on the same day. But most of the focus is on the presidential race and incumbent Joko Widodo, widely known as Jokowi, who remains the strong favorite against challenger Prabowo Subianto, a former lieutenant general whom he defeated in a tight election five years ago. Most polls show Jokowi with a wide lead, although Prabowo’s campaign could be picking up steam in its final days.